Splitsville: Tiger Woods and Sean Foley. What’s next? 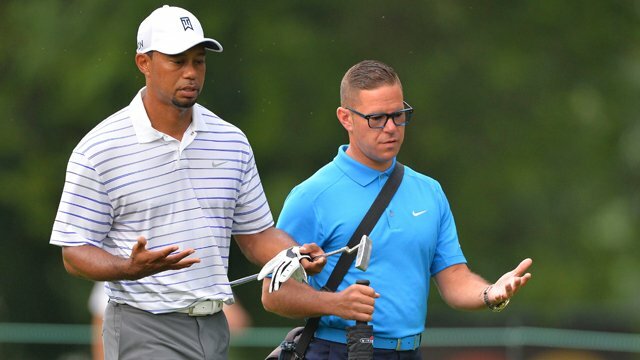 On Monday, Tiger Woods announced on his website that he and his instructor Sean Foley had parted ways, ending a teaching relationship that began after the 2010 PGA Championship. Previously, Tiger had stints with Butch Harmon (1993-2003) and Hank Haney (2004-2010). Although Tiger had a very successful 2013 season, winning five times including The Players Championship, he failed to gain ground on his holy grail quest of Jack Nicklaus’s career record of 18 major championships. And along the way, he has suffered physical setbacks on his back and knee. From a layman’s perspective, it seemed to me that Tiger tended to dip his head and didn’t stay tall when driving. His transition from the backswing to the forward swing was also too abrupt. At other times, he lacked a consistent tempo which resulted in some big misses with his tee-ball which can’t be tolerated. Statistically, Tiger’s driving accuracy was rated at 55.10% this year, admittedly a shorter season due to his injuries. In 2013, it was 62.50% and ranked 69th on Tour. In 2012, he was ranked 53rd. 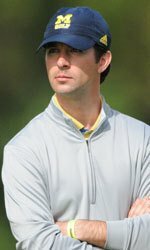 In 2011, his first full season with Foley, his driving accuracy was 48.90%. So there was improvement at first but then a fall-off. Looking back over the last ten years, Tiger’s was a fickle driver even under Hank Haney. But his misses were better and also mitigated by a rock-solid short game. It’s the decline in his short game prowess that drew my attention. In the PGA Tour’s scrambling stat from 30 yards in, Tiger managed to get up and down 26% of the time this past year. In 2013, it was around 26.5%. In contrast, short game master (although with occasional putting lapses) Phil Mickelson averaged 34%-35% over the last few years in the 30-yard scrambling stat. From 30 yards in, the best (Heath Slocum) averaged 51%. And the overall scrambling leader this year is Jim Furyk, making par or better 71% of the time despite missing the green. I have no idea who’ll be Tiger’s next swing guru but I’ll be very curious if Tiger returns to his once lofty short game method which provided so much support and strength to his long game.